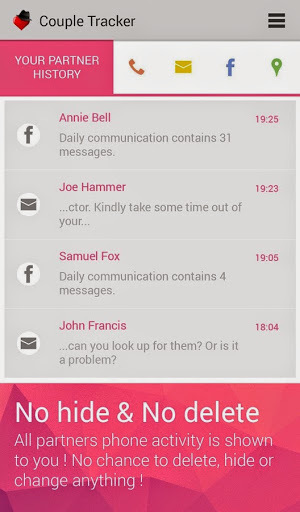 Couple Tracker – Phone monitor v1.69 – Couple Tracker is BEST AFFAIR AND CHEATING PREVENTION AND DETECTION MOBILE APPLICATION FOR PARTNERS, lovers and husbands ! ✔ Both will see 50 CHARACTERs of every SMS that your love receive or send. ✔ Both will see Call history of your partner (With names stored in his/her contact list). 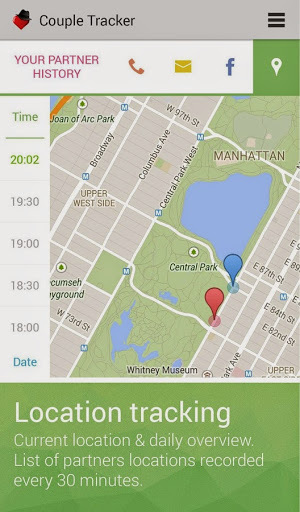 ✔ Current location is recorded and saved in 30 minute interval to location / GPS history. ✔ Location history is archived and shared for 2 weeks. ✔ Both will see Facebook conversation statistics (Name and number of messages per day). ✔ Both will see last message of each Facebook conversation. • Couple Tracker – Phone monitor is mobile monitor implementing unordinary “trust system” giving to your partner simple offer: “You will see 50 characters of my every SMS, all my call history and overview of my Facebook communication, under the condition that I will see same history/records of yours”. Fairly exchange is basic and only one limitation.